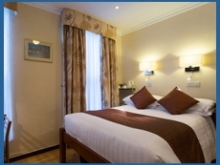 Our double rooms vary from room to room, some are fractionally bigger, some have slightly bigger bathrooms. 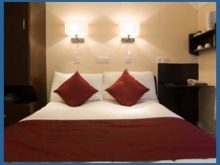 The rooms have a standard double bed. The twin rooms are slightly bigger than our double rooms. 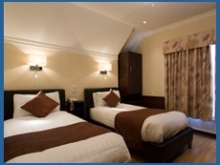 The rooms have two single beds. Our family rooms are still fairly compact, as are all our rooms. 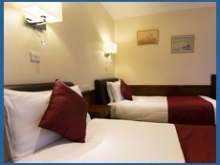 The room is ensuite with a shower, lavatory and sink unit and there is a small separate room for the children. One features a bunk bed ideal for a family with one of two small children. The other has just a single bed which is better suited for one teenager. However, in this room, we do have a roll away bed under the main double bed to accommodate another child. This is a little bit of a compromise and does reduce space in the room, but the bed can be pushed back under the main bed during the day. A big favourite amongst our regulars. The room has more storage space than any other room and also has our loveliest bathroom, with a bath Jacuzzi and a separate steam shower. This room also has a British style King-sized bed.